“If Memory Serves” makes television history by creating the longest arc between two aired television episodes, spanning 53 years. Three years after the events of the “The Cage”, Star Trek’s original pilot, Captain Pike is brought back to Talos IV and his love interest Vina, and casting a shadow over Pike’s future. Spock has brought Michael to Talos IV as he knows the Talosians – with her help – can bring his mind back into a linear experience of time. Team re:Discovery discuss memories of “our” Melissa George, parallels with Doctor Who and the new Hulu show PEN15. How’s this related to Star Trek? You’ll have to listen to find out! In “Light and Shadows”, the search for Spock is finally over as Michael has an emotional reunion with her brother. Meanwhile Discovery finds a time rift whilst investigating the tachyon particles left behind near Kaminar, with Pike and Tyler bonding through space, time, robot octopi and touching fingers. This was an action-packed episode with a forward thrust, temporally, through all versions of Star Trek – re:Discovery is living for this episode and the rest of the season! This week’s episode “The Sounds of Thunder” returns Saru to his homeworld Kaminar. The Red Angel has directed Discovery there – but why? We finally meet the Ba’ul – the mysterious oppressors of the Kelpiens – and ponder what level of action is ethical to stop genocide (you know, just regular Star Trek stuff). Team re:Discovery return to “that episode” to discuss the huge amount of listener feedback we received, and cheekily deliver our audit of #startreknudebutts. Thanks for listening! In this week’s episode “Saints of Imperfection” the Discovery crew launch a mission to rescue Tilly from the mycelial network and pursue Spock’s shuttle craft. This episode is heavy with entities existing where they shouldn’t – Phillipa Georgiou on Spock’s shuttle, Pike’s old friend Leland running Section 31, and in the season’s first (expected) whoa moment, the highly problematic return of Hugh. 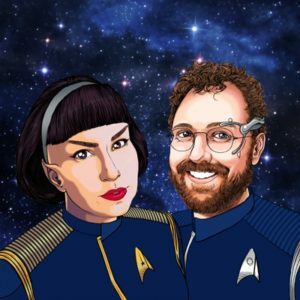 Team re:Discovery discuss the history of the theoretical tachyon particle, body diversity in the crew, the queer significance of Discovery and the technology of transporters. Like everything in this episode, it doesn’t work how you think it does! Set your face to ugly cry – in this week’s episode “An Obol for Charon”, Discovery’s most elegant soul, Saru, faces a fatal illness – the vahar’ai; the ship is held in place by a sentient orb which causes havoc to its systems; and Tilly is consumed by the fungal entity “May”. Team re:Discovery discuss the central theme of polarisation between action and surrender, whether we exist if there is no one to remember us, the “soft butch showdown” between Stamets and Reno, if shirtless Saru met our expectations and much much more. So grab a hanky and press play!